Walthew House is an independent charity in Stockport that provides practical and emotional support to people who are Blind, Visually Impaired, Deaf, Hard of Hearing or who have Dual Sensory Loss. 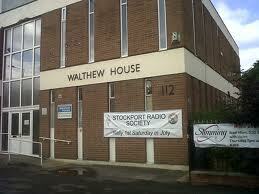 The charity was created in 1882 and is named after its founder John Walthew, a former Mayor of Stockport. On 7th July 2009, Walthew House merged with the Stockport Centre for the Deaf to become one charity (registered charity number 215469). We regularly hold events to raise money for our charity and to raise awareness of the challenges facing people with a sensory loss. In 2017 some of these events included a charity auction with lots such as sporting experiences and family attraction tickets, as well as a wine tasting evening hosted with Helen Jones Wines. Thank you to everyone who supported these events. The dates of our current 2018 events can be found below. If you would like to attend, support or volunteer at one of these events then please get in touch with Dan Oliver on 0161 480 2612 or funding.walthewhouse@ntlbusiness.com.